Whitney Center for the Arts presents the Berkshire Premiere of The Fabulous Lipitones by John Markus and Mark St. Germain, a fully staged Musical, directed by Monica Bliss and Musical Director Jeff Hunt with Choreographer Ruslan Sprague, August 10-19th. The Fabulous Lipitones explores what happens when a barbershop quartet loses a key member to a heart-stopping high “B flat?” The three surviving members suddenly find themselves scrambling to find a tenor before the national competition. When the golden tones of “Bob” are heard through the phone the Lipitones are all ears… but when they meet him in person, he’s not quite what they expected. An uproarious comedy of misunderstanding, stereotypes and the path to perfect harmony. 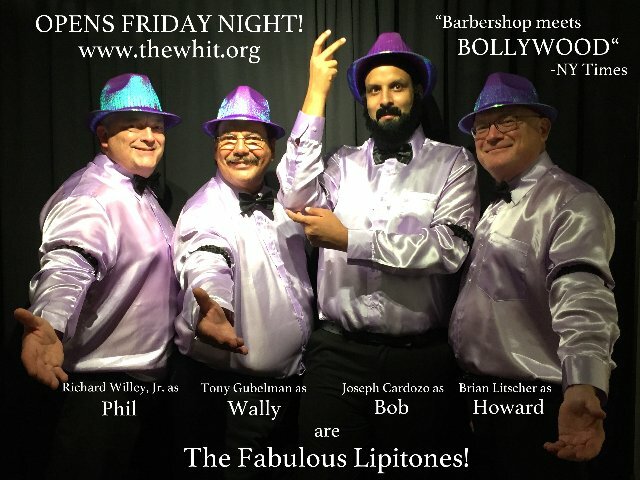 New York Times said The Fabulous Lipitones is “Barbershop goes Bollywood, a song stuffed comedy”. Broadway World said “It is said that music has the power to bring people together. This proves to be true in The Fabulous Lipitones.” And, Grigware called it "Deliciously funny". Playwright John Markus is an Emmy Award-winning writer, playwright, director, and television producer. He work has earned an Emmy, a Peabody back-to-back Humanitas prizes, and a People’s Choice award for "The Greatest Sitcom of All Time." Playwright Mark St. Germain, whom Barrington Company's Stage 2, the St. Germain Stage is named after, wrote the Off Broadway Alliance Award winning Freud's Last Session and the Outer Critics Circle and the Lucille Lortel Award winning Camping with Henry and Tom. This summer marks the theatrical directorial debut for Monica Bliss, opera and musical theater singer, actor and the Whit's Director of Performing Arts, a position to which she was appointed Fall of 2017. Directing team Monica Bliss and Jeff Hunt also direct the three-time sell-out holiday variety show, Christmastime in the City, which returns to the Whit this December. Choreographer Ruslan Sprague joins directing team Monica Bliss & Jeff Hunt to bring The Fabulous Lipitones to the Whitney Center for the Arts's stage. Monica Bliss is the first woman to ever direct the Fabulous Lipitones. Located at 42 Wendell Avenue in Downtown Pittsfield, the Whitney Center for the Arts, a presenting and producing arts center, has two world-class art galleries and presents Comedies, Drama, Musicals, Concerts, Opera Nights, Cabarets plus events for teens and children in an intimate, air-conditioned performance venue.